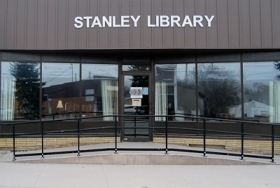 The Stanley Public Library joins libraries in communities nationwide in celebrating National Library Week April 8-12. During the week, children ages 3-18 who visit the library may register for daily prizes and for grand prizes to be given away at the end of the week. They are encouraged to read a book, build a LEGO display relating to the book and bring it to the library to be displayed all week. There will be games, crafts and other activities for children in grades K-12 from 4:00-4:45 on Monday, Tuesday, Thursday and Friday. On Wednesday, the public is invited to tour the library and coffee and cookies will be served from 2:00-4:30. The Friends of the Library will hold a used book and movie sale and will also be selling souvenir library playing cards all week. National Library Week is the perfect time to visit your local library to take advantage of the wonderful library resources available. Check out the library in person!